Current I'm now a professional physicist. Isn't that awesome? Exams are done! I'm free! "Life is complex - it has real and imaginary parts." 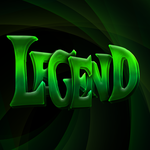 I am a Roleplayer with an interest in science fiction and fantasy, with a preference for Casual. I have been roleplaying for several years, and have even taken a stab at running a few RPs. Outside the Guild, I am an Australian science student, gamer, musician and roleplayer (that's right, IRL too). We are new-born gods, summoned into an empty World by the powerful and enigmatic Architect. Our purpose is to create and fill the world of Galbar and the godly Spheres surrounding it, although with such a diverse pantheon there is all manner of disagreement over what to fill the world with. I co-GM this roleplay. I also play as Ashalla, the Goddess of the Ocean. We are new-born gods, summoned into an empty World to create a Universe where the last one was destroyed. Some wish to build it up, others wish to tear it down, and there is great conflict over what kind of Universe to create and what to put in it. I play as Teknall, the God of Crafting. He's a nice guy. I was also promoted to co-GM about half way through. I played Torrens Igneus, a cunning fire demon and veteran servant of Dungeon Keepers throughout the ages. I GM'd this one. I controlled King Reginaldus, the sorcerer king with the power to read and manipulate people's minds while they slept. I've played in numerous past iterations before, although not all were on the Guild. In a land where magical crystals power modern technologies, a terrible Cataclysm strikes the capital city. Spirits good and bad are unleashed upon the populace, and the military seal the entire city away behind an impenetrable wall. The spirits fuse with many people, granting them powers but also driving many to evil and violence. The players must try and survive in this post apocalyptic cityscape, and maybe even find a way to escape. I played as Zachary Mason, a kind-hearted, prodigious engineer, who is possessed by Kaa'is. He gains powers to control metal and read machines, but Kaa'is also drives him to become physiologically addicted to murder, an addiction he tries to suppress. Tabletop section. The gist is that you get to invent your own special moves when you level up, tailored to your hero. I played David Pierce, a serious and dark gunslinger. Ashalla floated through the ocean south of Dragon's Foot, dark clouds and tempestuous winds following her. Around her squalls seemed to take a life of their own, drinking in the residual anger of her encounter with the Leviathan Angler. These miniature storms boiled off from her discontent and flitted about. The melancholic melodies of Vakk's music box did little to calm Ashalla, despite Vakk's claims, but the music seemed to keep the squalls pacified enough for them to avoid Ashalla's direct attention. Once the music had drifted out of hearing of the squalls they became much more boisterous. The baby tempests drank moisture, rode winds, built clouds and rained. They jostled and squabbled, jousting with gusts to claim each others moisture and energy for their own. This violent dance twisted clouds and stirred the sea, although it was short-lived as the squalls soon dispersed. The squalls scattered across Galbar in search of more stormy conditions or divine anger to feast off, or some beings to hurl their inner anger against. Perhaps, if enough of them united together, they might have been able to produce a proper storm, but on their own they would rarely pose a credible threat. And such discordant beings would never unite of their own accord. Ashalla paid little heed to the squalls. As she contemplated the source of her discontent, she remembered K'nell's words - there are things even a God cannot see or create without a little help. Though Ashalla had not admitted it at the time, she knew K'nell was right, and now she saw that it held the solution to her current situation. The Leviathan Angler had attacked the Zhengwu because she had not been present to enforce her will. 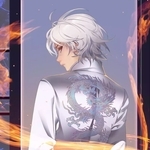 One option would be to create some fragment of herself, like Shengshi's Xiaoli or Sartravius' Phoenix, but the ocean was far too vast for a single extra entity to provide adequate coverage. So Ashalla decided she could make many creatures. They would not be direct extensions of her will like a god-fragment would be, but they would be receptive to her will, like the Thunderbird was, so would be able to enforce her will in her absence. They would also stop the Leviathan Anglers from being the only extraordinary beasts to roam her ocean. And because the journey was slow while carrying the music box, she had time to create. Ashalla started with the pattern of a predatory fish and scaled it up to enormous sizes, rivalling whales. This gargantuan shark had a powerful jaw and great teeth which could puncture through the bodies of creatures it attacked, even creatures larger than itself. The shark's great mass was itself a weapon, for it could ram lesser creatures which enough force to injure them severely. Ashalla created more of these megalodons and released them into the ocean, where they would hunt whales and other sea beasts. The megalodons were terrific demonstrations of strength, but Ashalla did not feel this was enough. So she took the pattern of a squid and scaled that up to be colossal as well. Its arms and tentacles were given wicked hooks and toothy suckers. Two tentacles were extended to be much longer with spiked clubs on the end, and between all the tentacles was its great beak. The colossal squid could use water to jet-propel itself through the water for bursts of speed, and could spray a cloud of black ink along with that jet to confound potential predators. It had massive eyes so it could see in the dark depths of the ocean. The squid was coloured red, and Ashalla also added bioluminescent patches, both to enhance its beauty and to lure in prey. Ashalla created many of these creatures. The megalodons were well suited for tropical and sub-tropical waters, while the colossal squids were suited for the deep depths of the ocean and the polar climates. But Ashalla knew they were not enough, for many Leviathan Anglers dwarfed even these creatures in size. She needed a bigger creature. And, because only a couple hundred anglers existed, she only needed one creature. Biomass began to accumulate at Ashalla's call. The general pattern of the colossal squid impressed her with its versatility and elegance, so she decided that this beast would be a cephalopod. To support its enormous bulk and to provide a measure of internal protection, Ashalla built a large, round, porous bone of calcium carbonate which would be used to control buoyancy. Within this bone Ashalla placed many internal organs, and she covered the bone in flesh. Around the edge of the body she put fins and fans which would provide a means of steady locomotion. Towards the front she placed two large eyes, a beak and many tentacles. Toothed suckers ran along all of these tentacles, and the longer tentacles ended in barbed clubs. Like other cephalopods, it also produced ink, which it could use to cloud the water around it. Although the creature made the two species Ashalla just created seem miniscule, this beast had more besides sheer size and strength to make it extraordinary. Its tentacles could regrow if severed - not immediately, but it would not be permanently maimed by the loss of some tentacles in a battle. However, the biggest feature Ashalla added was to its skin. Chromatophores and photophores covered every part of the creature, allowing it to change its colour and produce light at will, much like Hermes could except with bioluminescence as well. A complex array of muscles also allowed the beast to adjust the texture of its skin and even, to a minor extent, the shape of its body. These abilities could be used equally well for beautiful displays or for camouflage. Ashalla released the gargantuan creature and it came to life, swimming around her. Ashalla looked upon the creatures she had made and decreed, "Megalodons, colossal squids, heed my words. You are not to harm anyone to whom I have promised protection. Now spread through my ocean so my influence may be seen everywhere." The megalodons and colossal squids then dispersed to fulfill Ashalla's will. The ocean goddess then turned her attention to the gargantuan colourful cephalopod she had created. "Kraken, you are to enforce my blessings of safe passage. Ensure that no beast of the sea harms those to whom I have promised safety. You are to enact vengeance on any creature which defies such decrees," Ashalla commanded, "Now go to the Zhengwu and ensure no other creatures attack the ship. Suffer no Leviathan Anglers in your presence. I will speak to you again if I have more commands." Obediently, the Kraken turned and swam northwards. Finally content, Ashalla continued swimming, listening to the music box. The island in which the Gateway to Sanvadam lay was barren as ever, but not silent. Whispers drifted up from the gateway, and shadowy forms lurked between the rocky spires. 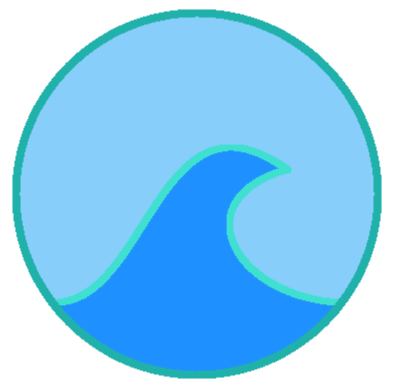 The ocean heaved and Ashalla flowed uphill and across the island while carrying the Box of Orchestration. Some of the shadows, seeing the living being approach, darted out. Their hungry white eyes marked their incorporeal forms as they swarmed into Ashalla's watery body. However, the incorporeal echoes could not tear free any part of the divine soul, and instead found themselves trapped in the goddess' grip. There was a slight ripple as she crushed the echoes. Several squalls manifested in Ashalla's irritation, and her eyes settled on them. "Deal with them," she said in a low voice like a rolling wave. The squalls flitted about the island and quarrelled with the other incorporeal echoes. As simple soulless beings themselves, the squalls were not threatened by the echoes' soul-stealing powers. And while the squalls could do little besides buffet the echoes around, that was enough to keep the echoes from disturbing Ashalla. Ashalla flowed through the illusory boulder which hid the cave mouth leading down to Sanvadam and looked inside the gateway. "Vakk," she called out, her voice echoing like thunder down the tunnels. The echoes of her voice died down to silence and Ashalla waited, longer than she had waited last time. Vakk did not come. "Vakk, I have your Box of Orchestration," she called out. She waited again. Still, Vakk did not come. A momentary blip of concern crossed through Ashalla's mind. Was Vakk busy, or elsewhere? Had Vakk been attacked? Why did he not respond? But ultimately these were not Ashalla's worries. Ashalla placed the box inside the cave. "Vakk, I'm leaving the box inside your gateway." Ashalla was worried about the possibility of Eurysthenes finding the box before Vakk. However, she reasoned that the box would probably be safer here than elsewhere, since she had frequently left the box unattended in the open ocean. Here, at least, it was hidden. Still puzzled as to why Vakk did not respond, Ashalla flowed back into the ocean and swam away. Squalls are created from Ashalla's grumpiness. Squalls are minor storm spirits. They spontaneously manifest when Ashalla is angry or stressed, and multiply in storm-generating conditions or near divine wrath. They are petty, angry and destructive beings prone to infighting, although rarely are they strong enough to be more than a nuisance. Squalls are pacified by music. They are soulless. Ashalla realises that she needs helpers, like K'nell said. To loosely enforce her will and dominance in the ocean, Ashalla creates megalodons and colossal squids as extraordinary species. Then, as a single beast of phenomenal power, Ashalla creates the Kraken. Her Kraken is patterned after a Giant Cuttlefish, so it possesses cool colour-shifting properties. Megalodons and colossal squids spread throughout the ocean. They will never attack anyone to whom Ashalla has promised protection. They also compete with other sea monsters, hopefully stopping Leviathan Anglers and any creatures made by other gods from having a monopoly. The Kraken is sent to keep an eye on the Zhengwu and to 'suffer no Leviathan Anglers in your presence'. Ashalla makes it to the Gateway to Sanvadam. She is rudely greeted by some Incorporeal Echoes. She sends some squalls to deal with them. She calls to Vakk, but gets no response, and this troubles Ashalla. She leaves the Box of Orchestration inside the Gateway behind the illusory boulder then leaves. Ashalla floated through the ocean between Atokhekwoi and Dragon's Foot, carrying Vakk's music box with her. The journey was slow by her standards, but she passed the time by listening to the box's melodies. But as she swam, she sensed that something was amiss, although she struggled to identify exactly what. The box failed to soothe her anxiety over this feeling of wrongness. Then she heard Qiang Yi's prayer. O Holiest spirit of the Sea, Ashalla. Your grace and power are second to none in the ocean - as such, this servant asks that Your sacred boon follows us still as our voyage progresses. Thank You for everything. Why would Qiang Yi ask for a renewal of her boon so soon after having received it? Had not her word been enough? Unless some event had made him doubt. Then Ashalla realised that what she had been feeling must have been a violation of her blessing, some occurrence which had defied her divine will, and this had led Qiang Yi to doubt her word. Immediately, Ashalla left the Box of Orchestration and swam as quickly as she could towards the Zhengwu. When Ashalla reached the southern peninsula of the Kick, she could see the dispersing remains of the battle. Sharpened sticks and splintered planks and bark drifted in the sea, along with a few sets of clothing. The Zhengwu floated near the shore, damaged. And in the water, Ashalla could taste a trail of black blood. She recognised the creature it came from. The wind began to pick up and clouds darkened the sky as she saw the proof of what had happened. There would be a reckoning. But first, there was reparation to do. She looked upon the Zhengwu and inspected it. The crew were wounded but recovering; there was little that Ashalla needed to do there. She noticed with a touch of pride an effigy depicting an oceanic woman on the bow of the ship, which she assumed was a rendition of herself. The most pressing issue for the ship was the breach below deck near the stern, which was allowing seawater to leak into the ship. Several servants were trying to repair it, but as they could not enter the water they were having difficulty. Although Ashalla knew nothing of ship-building or carpentry, she could help with this. She extended her essence into the ship through the breach, becoming the water which had leaked in, then she pulled out of the ship, taking the water with her and leaving the inside dry. On the outside of the ship, Ashalla froze the water around the breach to stop the influx of water. It was a short-term fix, as the ice would melt in these warm waters, but hopefully it would be enough time for the servants to repair the breach. Ashalla then turned and swam after the trail of blood, taking the tempest of her simmering rage with her. The leviathan angler swam lethargically through the depths of the ocean. This angler had acquired a few small scars along its front, and one of its left eyes was missing, leaving an empty socket. Its tentacles were suspended around it, sensing for any vibrations which would indicate an approaching creature. Its light cast an eerie glow through the water, which it hoped would attract something to eat. Then it saw a school of fish, attracted to its lure. Their iridescent scales flashed in the angler's light as they swam closer. The angler waited, mouth slowly widening as its next meal drew closer. Then, when the school of fish was within lunging range, the creature tensed its fins and tentacles to surge forwards. But at that very moment, it sensed movement all around it, and as it lunged the water around it grew heavy and thick, immobilising the leviathan angler. The school of fish scattered, but the abomination suddenly had much more pressing matters vying for its attention than food. "I had promised that ship safe passage through my ocean," seethed a voice like a rumbling storm. The ocean water held the angler in place with crushing pressure. The angler could not move, and a simulacrum of fear began to emerge from its frayed soul for the first time in its existence. "Then you attacked that ship, in defiance of my promise." The voice grew in intensity, her fury evident. The water stilled around the angler's gills despite the surrounding turbulence, denying the angler oxygen. The water pushed into its mouth and the pressure inside the angler began to increase. "Now they question whether my blessing is still with them." The water pushed harder into every crevice and facet of the abomination. Its wounds re-opened and oozed black blood into the ocean. The angler was not capable of many feelings, but pain was one of them, and it was feeling pain even worse than when it had lost its eye. "You have made my words untrue, cast me as a liar!" The voice now roared with the tempestuous fury of a maelstrom. The angler's gills and other eyes started to bleed, and it could feel indescribable pain as internal organs ruptured. The voice screamed into a climax. "For that, you die!" The water surged inwards, and in the blink of an eye the leviathan angler exploded. Shreds of meat and shards of bone billowed outwards in an expanding cloud of black blood and bile. Where the angler once was dwelt Ashalla, her rage peeling off her as turbulent currents which stirred and spread the remains of the leviathan angler. In time the remains had dispersed, and Ashalla's anger had subsided. "May that be a warning to you," she called out through the ocean to leviathan anglers and other sea beasts. "The ship bearing Shengshi's servants is not to be harmed." Her retribution complete, Ashalla swam off, returning to the Box of Orchestration. Ashalla senses a disturbance in the force, hears Qiang Yi's prayer, puts two-and-two together, and races off to inspect the Zhengwu. She comes across the aftermath of that ship's battle against a leviathan angler. This makes her angry for the first time ever. Before acting on her anger, though, Ashalla provides some minor assistance with the repairs. She dredges all the seawater out of the bottom of the ship and slaps a big ice band-aid over the breach in the Zhengwu's hull, hopefully giving the servants enough time to fix it properly. She leaves without saying anything, although the crew would have noticed a brief tempest stir. Ashalla tracks down the Leviathan Angler which had attacked the Zhengwu. She is absolutely livid, for she had promised the ship safe passage yet this creature of the ocean had attacked the ship, defying her divine words and casting her as a liar. As punishment, she explodes the Leviathan Angler in a particularly painful and gory manner. This, I think, is the first smite in Mk 3. Ashalla shouts a warning to all the other sea creatures. Throughout this post, the Box of Orchestration was left unattended. The red-stained trees and plains of the Great Hooflands were overcast with grey clouds delivering tropical rain. Overlooking these plains was Mount Chop, and atop Mount Chop's plateau was the Thunderbird sitting in her nest. Gnawed bones were littered about the nest. Now the Thunderbird rested on top of her warm eggs, her wings stretched out to shelter them from the rain. She had been guarding her eggs carefully ever since the Phoenix had left, being careful to not leave the nest too long while hunting. The Thunderbird shifted slightly as she felt something move under her. The Thunderbird stood up and looked beneath her. A tiny fracture appeared in one of the sapphire-and-ruby eggs. The Thunderbird nuzzled the egg with her beak. Tap. Tap. Crack. Tap. Crack. Crack. Tap. Crack. More cracks appeared in the egg, radiating out from a point as a tiny beak began to break through. The Thunderbird tilted her head to look at the hatching egg up close with an eye. Tap. Crack. Crack. Tap. Crack. Tap. Tap. Crack. Crack. Crack. Crack. The tiny hatchling's beak tore apart a line through the eggshell. Then the egg bulged and buckled and the tear propagated as the hatchling pushed against the edge of its egg. Crack. Crack. Creak. Crack. ... Crack. Crack. ... Crack. "Squawk." The hatchling finally forced its way out of the egg and fell upon the leaves and branches of the nest. Its bare pink skin was moist with yolk and a few dark-coloured feathers were matted on its back. Two oversized eyes and a beak were on the infant's disproportionate head. It had four limbs with little fingers with under-formed talons, and a stubby tail protruded from its backside. "Coo." The Thunderbird rubbed the hatchling with her beak. The newborn bird was unphased by the little sparks of static electricity which jumped from the Thunderbird to it. As drops of rain fell upon the newborn, steam rose from the water, heated by its supernaturally warm body. "Squa squawk," the hatchling chirped and tilted its head up expectantly towards its mother. The Thunderbird lifted her gaze to the remaining eggs. Already, another egg was starting to rock as the baby bird within prepared to hatch. The rest would hatch soon, and they would be hungry just like the first one. "Caw," she said. She then hopped over the edge of the nest and with a thunderous wing-beat took flight over the Great Hooflands. Over the following days, the Thunderbird fed her nest of hatchlings. As the Thunderbird was so much bigger than the hatchlings, she was easily able to feed them all, even though there was a large number of them. They were growing up quickly, their plumage growing out and their bodies becoming larger. The feathers of these new avians were dark shades of red, blue and purple. While many of their features were bird-like, their wings had arms incorporated into them with talons, and the avians often walked on four feet like pterosaurs. Despite their small sizes compared to the Thunderbird (although already they were larger than most birds), their cries were incredibly loud. Their thunderous squawks carried across the land surrounding Mount Chop, so the Thunderbird always knew whether the chicks were hungry or distressed regardless of where she was. As the avians grew and their plumage came closer to completion, their other powers became apparent. Breezes always swirled about the nest as the chicks played and moved. And occasionally the hatchlings would spontaneously combust, their feathers becoming coated in flames. This fire did not harm the hatchlings, although the nest was not so durable. The Thunderbird layered the inside of the nest with mud to stop it from burning whenever the chicks ignited. And when the chicks were startled or spooked or sometimes just nudged their feathers would flare with dazzlingly bright light. The flight feathers of the avians grew, and the Thunderbird knew that she needed to encourage them to fly. When she came with food for the fledglings, she stood progressively further away, coaxing them to leave the comfort of the nest. She also held the food higher up, encouraging them to jump and flap their wings to try to reach her beak. In time the avians were not confined to the nest, but roaming about the plateau of Mount Chop. Sometimes they would wonder off the edge of the plateau, sometimes at the prompting of their mother, where they would fall a distance and had to climb their way back up. In this way, the fledglings learned how to fly in order to climb back up to the plateau where their mother waited with food. It was during this time that a familiar storm rolled over Mount Chop. The Thunderbird looked up expectantly as wind, rain and thunder came her way, and the nest full of fledglings also perked up and started calling out. When the storm was directly overhead, the thunder sounded like words. "What have you got there, Thunderbird?" "Caw! Coo, caw!" the Thunderbird cried out. There was a surprised pop of lightning from within the cloud. "A big fiery winged creature... Ironic." "I shall not tell. I also desire to see your children prosper," Ashalla answered. Rain fell upon the nest of fledglings and the wind whipped around them in circles. "May the wind blow in your favour, the rain fall when you need it, and the storm always be your friend. This is the blessing I give to you, Pyrgerakia." The fledglings chirped and squawked happily. Some jumped up to fly in circles in Ashalla's breeze. The breeze then became a strong gale and pushed the fledglings away from the nest. A narrow cone of spiralling cloud and wind snaked down from the cumulonimbus to a specific point in the nest. Mud and twigs were blown outwards as a wooden box was lifted into the air within the miniature tornado. A surge of rain washed the box clean of mud and feces, and the box was pulled up into the cloud. The box had a few scratches and scorch marks on the outside, although the damage was only superficial. Clearly, a nest full of burning baby avians was not the optimal place to store such an artifact. "I am taking the box away now. I have found a safer home for it," Ashalla explained. The wind changed and the storm blew back towards the east from where it came. The Thunderbird let out several peals of thunder in farewell, and the Pyrgeraki fledglings cried out with their own thunderous voices. It was not long before the Pyrgerakia were grown up and ready to leave the nest for good and claim their own territory. A storm rolled past Mount Chop, and the Pyrgerakia took this as their cue to depart. 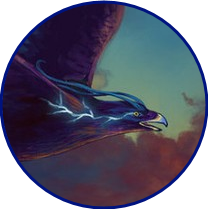 The cries of the Thunderbird and her children could be heard for many kilometres as the Pyrgerakia caught the wind in their wings and took flight across the Great Hooflands and beyond, trailing fire and light through the skies. Fully grown, a male Pyrgeraki had an average wingspan of four metres while a female Pyrgeraki had an average wingspan of three metres. All had plumage in various shades of dark blue, red and purple across their bodies, although the males had more red and the females had more blue. The mature males also boasted an impressive feathered crest. The Pyrgerakia found rocky places in which they could roost, favouring cliffs and mountain-tops. Their winged forelimbs made climbing and navigating sheer cliff-faces easier than for regular birds. The females in particular found good places to build nests, where males could come to court them with songs, offerings of food, and displays of fire and light. The Pyrgerakia were predators, hunting any creature smaller than themselves. While wing and talon were often enough to catch most creatures, they had another trick to help them catch prey more easily. One or more Pyrgerakia, often male, would burst into flame and fly through the undergrowth, setting it alight. Other Pyrgerakia, often female, would create wind to fan the flames in the direction they desired. The resultant bushfire would drive animals out into the open where the Pyrgerakia could hunt them more easily. They only did this occasionally, otherwise all the forests would be burned down, but when they did they produced a great feast for the participating flock. The Pyrgerakia spread across Atokhekwoi. They were hungry beasts, so each Pyrgeraki demanded a sizeable territory for themselves and their mate. But they were rarely hard to find, for their calls, particularly the calls of the females, were deafeningly loud from up close and carried for great distances like thunder. In this way thunder and fire were carried across the super-continent. The Thunderbird's eggs hatch, revealing the offspring of the Thunderbird and the Phoenix. The avian offspring grow up, becoming the first generation of Pyrgerakia. They inhabit Atokhekwoi. Ashalla drops by in the middle of the post. She's surprised that the Avatar of Sartravius of all beings procreated with the Thunderbird. She blesses the Pyrgerakia so that storms are on their side, and gives them their name. She also takes the Box of Orchestration. The FP for the species was spent in the last Thunderbird post. The blessing was discounted by the Storms Portfolio. Wingspan 3m (female) or 4m (male). Plumage is mixture of dark blue, dark red and dark purple. Plumage can burst into flame at will without harm to the bird. This is often done to light fires for hunting purposes, or for displays. Beyond simple fire, these birds can emit blindingly bright light. This is often used as a defence mechanism, and for display purposes. They can produce a noticeable breeze. This can be used to help control the fires they light. Their cries can be deafeningly loud. Also a defence mechanism, and allows their calls to carry over incredible distances. Immune to fire and lightning, at least to the degree that these elements appear naturally. Males have redder plumage, a crest, and amplified fire powers. Females have bluer plumage and amplified storm powers. Ashalla roamed the oceans once more, exploring and thinking. She had much to think about. She imagined what the winter-spirits would sculpt. She wondered what the Thunderbird was up to. And she reflected on the story she had heard from the magpies and K’nell. Ashalla inspected every passing cloud to see if any carried a fragment of Li’Kalla’s soul, although she found nothing. She considered going to see Li’Kalla or Vakk in person. She knew the large sandy island where Li’Kalla’s influence was strongest. As for Vakk, though, the only definite signs of his essence that Ashalla had noticed were the music box and the boiling strait which was the Saluran Mendidih, although neither were Vakk’s home. It was then, as Ashalla was thinking about Vakk, that she came across a strange small island she hadn’t truly noticed before, south of the Great Soul Reef and east of Dragon’s Foot. She had known there was an island there, for she had explored Galbar’s oceans many times over and knew their every feature intimately, but somehow this island had always eluded her full attention and had always been mentally sorted as just another rocky island. The geography was comparable to the cliffs of Pāṟa, with jagged rock everywhere. Some lichen and mosses had taken root on this stony land, but it appeared that the Gemstone Gardeners had either missed or avoided this place since no other life was present. It might have passed for a mundane island if not for two things: strange whispers could be heard on the edge of Ashalla’s hearing coming from further inland, and Ashalla’s divine senses could detect a distortion in the space between Spheres in this vicinity. The ocean heaved and surged up the beach of the island as Ashalla made her way towards the anomaly. Ashalla climbed inland, flowing up the rocks and around the cliffs. She soon found one rocky crag which was unlike the others, for Ashalla’s divinely attuned senses could tell that there was something unreal about it. She flowed into that crag and the illusion broke, revealing a dark cave leading into the depths of the earth. Ashalla did not think much of it, though, as she proceeded to flow down into the cave. But it was not long before Ashalla realised that she was getting terribly lost. The twists and turns and corners of the cave’s path made navigation difficult and disorienting, and Ashalla knew that the exit to this labyrinthine passageway was very, very far below her. Finding her way through this maze was not worth her effort, so Ashalla turned back and followed her trail of moisture back to the surface. She did not need to visit Vakk’s Sphere. His audience would suffice. There was a much easier way to gain his attention than climbing through some impossible maze. After some time, the massive head of Vakk emerged from the entrance of the cave, looking down upon the ocean goddess while the rest of his body was shrouded in the darkness of his cave. Vakk, however, did give a smile to Ashalla before he finally began speaking, “Greetings, Ashalla. I believe this the first time that we have met.” His voice was deep and did not display any true emotion towards the goddess as he seemed to inspect her. “What is it you wish to talk about?” he asked, moving slightly closer to the goddess. Some tendrils moved out of the darkness like large snakes before they rested themselves on the rocky surface of the island. Seeing the large form of Vakk emerge, Ashalla drew up water from the ocean until she had swelled to be slightly larger than Vakk. “I hear you got into a fight with Li’Kalla,” Ashalla said with a voice like rolling waves, her tone neutral. “Ah… Yes,” Vakk confirmed before he held up the broken end of one of his tendrils, “She attacked me in defense, yet, the start of the fight was not my fault. Another god had overpowered my mind and compelled me to retrieve an artifact from her. I- I did not want to hurt her.” His voice had begun to crack up as if he were on the verge of crying, unable to cope with the fact that he had to do such a terrible act. As a sign of timidity, he moved slightly back from the ocean goddess and looked to the ground in an act of shame. He seemed to ponder for a moment, silence dragging by before he replied, “I cannot say I do.” Within a second of silence Vakk had begun to speak again, “The artifact that Eurysthenes was attempting to get was a music box that I called the Box of Orchestration. A mortal named Hermes had apparently stolen the box from Li’Kalla, would you know anything about my box?” he asked inquisitively, tactfully changing the subject, seemingly to avoid talking about Li’Kalla anymore. Whether it was his own fear of the situation or not, was the best any could guess. “What?” Vakk paused for a moment considering all the trouble he had gone through with making a beast to hunt down the thief, his jaw merely dropping in shock. The Lord of Talk let out a laugh, unknowing of what else to actually do at the appearance of this news, and it was a maddening laugh indeed. Many moments had passed before Vakk contained himself, looking upon Ashalla with a wide and crooked smile. “May I have it back? I must hide it from Eurysthenes before he can get his filthy hands on it,” he requested, his tendrils slithering further across the ground, towards the goddess. Vakk was silent but for a moment, his tendrils shifting around as he began to speak in a low tone, “He sought to make it into a weapon to control people, he knows the music I had made was to induce a soothing feeling. That was the reason I had given it to Li’Kalla, but when I divulged this information to Eurysthenes, he wanted the box like the greedy stain that he is.” Satisfied with this answer, Vakk moved closer, coming out of the shadow of his gateway. “I thank you. Now, it seems I will also have to ask you something. Who told you that I had attacked Li’Kalla? I feel as if whoever told you would not have known all the facts,” he indulged, continuing to hide in the shadows of his cave. “I first heard it from some black-and-white birds, magpies. They’ve been flying everywhere telling the story they have. They received their story from K’nell, who told me more about what he knew,” Ashalla stated. Ashalla began to ebb. “It seems like I should get the box now. Unless you had more you wished to talk to me about,” Ashalla said. Ashalla stumbles across the Gateway to Sanvadam. She has some questions for Vakk, but can’t navigate the Gateway, so she calls for Vakk. Vakk emerges. Ashalla opens the interrogation by asking Vakk about his fight with Li’Kalla. Vakk claims that he only did what he did because he was being controlled by Eurysthenes to retrieve an artifact, the Box of Orchestration. Ashalla appears to believe Vakk’s story. Also, Ashalla seems not to be overly concerned about the violence. She’s more focussed on the fact that Vakk lost (even though it was a tactical withdrawal) a fight against the weakest of the gods. As Ashalla asks about the fragmentation of Li’Kalla’s soul, Vakk denies knowledge and shifts the subject to the Box of Orchestration. Vakk asks if Ashalla knows anything about it. Ashalla reveals that she’s had it the entire time, and Vakk is surprised. Ashalla asks what the box does. Vakk claims it was to produce a soothing feeling, and that Eury wanted to weaponize it to control people. Ashalla mentions the un-soothing effect it had on Azura. Vakk claims that it may have been drawing out stress, or it had been damaged by Hermes. Ashalla dismisses the latter and believes the former. Ashalla agrees to return the Box of Orchestration to Vakk for safekeeping. Vakk asks how Ashalla knew of his fight, and Ashalla answers, telling Vakk of the magpies and K’nell. After Ashalla leaves, Vakk is relieved to have gotten away with his lies and vows vengeance against K’nell. The storm which was Ashalla rolled over the northern coast of Atokhekwoi. While it was far easier for her to travel over land as a storm cloud, the sheer vastness of Atokhekwoi tired even her. It was ultimately the dry climate in the middle which made her turn away, for she had begun to lose water faster than she could recover it from the environment. So Ashalla returned to the ocean where she was most at home. The storm rained heavily over the sea, the cloud slowly shrinking and lightening. A few hours later there were only a few stray cumulus clouds and strands of cirrus, and Ashalla was the ocean once more. Immediately she began to plan her next creation. Kirron's mega-fauna and the smaller beasts of the forests elsewhere had inspired her. Many of these creatures were warm-blooded, breathed air, gave live birth and produced milk. This mammalian template appeared to be popular, so Ashalla decided she would attempt her own variation on the theme. Ashalla began to coalesce some biomatter into several new creatures. While they would not be fish, their general form was quite similar to that of a fish, for that form was optimised for ocean life. The basic mammalian physiology needed a few adaptations. Respiration was the biggest modification. The lungs needed to be much more efficient, as did the storage and usage of oxygen. An extra nostril was routed through to their top-sides so they could breathe at the water's surface more easily. The salt balance in the bodily fluids needed to be adjusted so as to allow these creatures to drink sea-water as fish could. They were given extra layers of fat to keep warm in cold waters. A few other modifications were made, such as enhancing their hearing to make good use of water's ability to carry sound, and adjusting their sleep cycles to ensure they did not drown. This was the basic template for her new life-forms, but she could still fit a lot of variety within this template. She made a few of them massive, larger than Kirron's dinosaurs, because given the buoyancy of the ocean she could do that without complication. The pattern was similar to the Eclipse Whale, but that was mostly by coincidence. The only thing abundant enough in the global oceans to feed such vast creatures was plankton, so these giant swimming mammals were given wide mouths and bristles of keratin in place of teeth with which they could filter out nutritious drifters from the water. Ashalla also made smaller swimming creatures, although still much larger than most fish. These ones she decided would feast on fish, so she gave them teeth. She also ensured their eyes were near the front of their snouts so they had binocular vision, and their enhanced hearing was combined with the capacity to make sharp clicks so they could locate objects and prey using sound. Ashalla painted their skin the colours of the ocean. As she inspected the creatures she had made, though, she felt unsatisfied. They were so utilitarian. Adapting a land-based physiology for life in the open ocean had been a fun exercise, but her creations needed a bit of artistic flair. So Ashalla taught them to sing and dance. They would call through the ocean, their thunderous voices carrying their songs for vast distances. They would swim around each other and leap from the water with great splashes. They would be social and have fun doing so. Satisfied at last, Ashalla gave the creatures life. She named them whales and dolphins, or cetaceans collectively, and sent them throughout the ocean. Ashalla also created new species of fish which would swim in the open ocean in great schools for the dolphins and toothed whales to eat. These fish ate plankton and smaller fish. In their great schools the light would shine off them in dazzling ways as the group danced in their own manner in an attempt to appear larger and more intimidating towards predators. Not that it would stop them from being eaten, but it would give them some defence, and it made them more impressive. These fish Ashalla spread throughout the ocean with the cetaceans. In roaming the world creating her new life-forms, Ashalla came to the north pole. She glanced at the ice sheet and reflected on it for a few moments. Then she made a decision. Fog rose from the ocean and a storm began to brew. The great storm which was Ashalla billowed over the ice sheet at the northern end of the world. The cloud hung low, a blizzard raging across the ice and stirring up snow. She looked over the ice formations and sculptures, feeling them with her fog and snow. Most of them were different to how she had remembered them. Time, weather and sunlight had eroded away many of the original sculptures and new ones had taken their place. But these new ones contained only abstract forms with no sense of coherence, for the processes creating new sculptures were blind and dumb. Ashalla found it disappointing that the beauty of this place had faded over time. But Ashalla was not one to wallow in defeat and disappointment. Rather, she was a creator. So she would create a solution. She would create creators to maintain the sculptures and create new ones, and she could marvel in their creativity. She just had to figure out what these sculptors would be. Shards of ice and snow stirred around within Ashalla. The ice sheet was inhospitable to organic life, but Ashalla had seen from the Curators, cloudlings and Xiaoli that there were other ways to make life. A being of ice crystals and frilly snow formed within Ashalla's clouds. This entity would draw energy as a heat engine, converting heat flow between it and its environment into work and potential energy. Of course, as a construct of ice, it would only survive for long periods of time in areas which were freezing in temperature. This entity was to be a sculptor of ice, so it would need an affinity for ice. Ashalla granted the entity the power to shape ice with its touch, melting and refreezing the water it touched with its spindly limbs to make the ice malleable. In this way the entity would be able to make ice sculptures and other structures of frozen water with relative ease. With the physical design established, Ashalla began to form more of these icy beings. While these beings would be safest in the North Pole, if they stayed in the North Pole forever they would have no inspiration for new creations. So Ashalla gave these beings a migratory instinct, such that they would fly south during winter and return to the North Pole in the summer. She gave them a few more instincts to maximise their creativity, tying those instincts to their methods of reproduction. Finished making these icy beings, Ashalla breathed life into their frozen forms, which accepted souls from the invisible soul ash around them. Then Ashalla withdrew her fog and the beings basked in daylight for the first time. The delicate ice crystals of their wing-like limbs shimmered in the light of Heliopolis, the beings fluttering about with their foot-wide wingspan. Spindly stalks of optically clear ice curled away from an orb at the head of their bodies, twisting and looking at the world around them. Icicle-like legs allowed the beings to land on the ice sheet and rest their wings. Soon all the beings had landed, basking in the sunlight as little rivulets of water ran up their legs and froze on their thoraxes. After they had drunk their fill and were fat from the ice, a great breeze blew across the ice sheet and picked up the beings, carrying them southwards. Ashalla's voice was also carried on that breeze. "Fly, winter-spirits. Learn and create." The warmer seasons were resting in the Purlieu, leaving winter on Galbar. Many of the higher latitudes were receiving snow from the So'E at this time. The usual greens and browns of nature gave way to a blanket of pure white. With the snow-falls came the winter-spirits. On the northern parts of Kalgrun, Kalgrun's mountains, Li'Kalla's Island, and even patches of Swahhitteh and Tendlepog the winter-spirits found perches in the snow-covered landscapes. They sat in the branches of trees made bare, having shed their leaves over autumn, or on mounds of snow or frozen ponds, but never in the shade. Their snow-dust wings spread out collecting the sunlight, providing them with the energy needed to replenish ice lost during their migration. During night time, once the winter-spirits had cooled to ambient temperatures, they were inactive, so some sought to find a safe perch out of the way of wandering animals before nightfall. Their actions were also sluggish when the weather was overcast, but when the sun was shining the winter-spirits fluttered about, studying the world around them with their sensory ice-stalks. The winter-spirits had a curious nature, and flew up to inspect an interesting creatures they saw. And there were many interesting creatures. 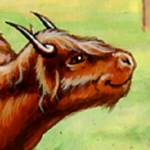 Kalgrun had griffons, trolls, dire wolves and bears along with a menagerie of other creatures and plants. On Li's Island were Parvus' beautiful insects, frogs and lilies, along with the strange creatures of mud, the beings of the salt-depths, and the monsters which lurked in the caves. On Tendlepog there were walking trees, cloudlings, exotic insects and numerous marsupials. On Swahhitteh, besides what had migrated from Tendlepog, there was also a great forest with muscular undergrowth and clear cords for trees which twisted the light in inspiring patterns. Some of the winter-spirits were crushed or eaten by the subjects of their study, as the winter-spirits were fragile beings, but as agile and harmless creatures with no nutritional value they usually avoided drawing undue attention. The winter-spirits also practiced shaping ice. They mimicked the flora, fauna and terrain around them in their sculpting. They even built new perches for themselves. In this way ephemeral ice sculptures appeared across the northern latitudes during winter. Once winter started its journey back to the Purlieu and the first signs of spring were beginning to enter into Galbar, the winter-spirits fattened themselves on the melting snow-patches before taking flight and migrating north. Like giant snowflakes in a snow flurry the winter-spirits carried themselves through the sky and over the ocean until they reached the northern ice sheet. On the ice sheet the winter-spirits set to work sculpting the ice into shapes they had seen. Each winter-spirit claimed a patch of ice to shape its own sculpture, often using worn down unclaimed sculptures as a base to save on work. The process of sculpting was slow for the winter-spirits were not large, but over time a vast plain filled with art took shape. The forms of the beasts and plants of Kalgrun, Swahhitteh-Tendlepog and Li's Island were common, but other forms also emerged. Some created chimeric fusions of the forms they had witnessed. Some attempted abstract forms, playing with shapes or light. Some shaped landscapes and maps. For each winter-spirit, the creation of elaborate art had an important purpose. As the sculptures were finished, the winter-spirits took off to inspect the sculptures of others. When a winter-spirit found a sculpture which impressed it, it waited around that sculpture until it could find that sculpture's creator. That second winter-spirit would follow the first back to its sculpture. If the second winter-spirit was not impressed, it would return to its sculpture, leaving the first winter-spirit. But if it was impressed, the two winter-spirits extracted a droplet of water from each others' abdomens and together they sculpted a new winter-spirit. In this way new winter-spirits were made from the best sculptors among them. And so the cycle was established. During winter, winter-spirits flew south to study the world and gain inspiration. During summer, winter-spirits nested at the north pole, breeding and creating new sculptures from the inspiration they had learned in the previous season. Thanks to the work of the winter-spirits, Ashalla's ice sheet would never be lacking in beautiful sculptures. Ashalla feels like creating marine mammals, so she creates cetaceans (whales and dolphins). Besides the utilitarian features, she also teaches them to dance and sing. She also creates oceanic fish which gather in impressive schools to feed the toothed whales and dolphins (baleen whales eat plankton). She spreads these throughout Galbar's ocean as an ecosystem. At the north pole, Ashalla creates winter-spirits. These are extraordinary creatures made entirely of ice. They are powered mostly by the warmth of sunlight and consume ice and snow. They fly, and look vaguely (very vaguely) like butterflies made of ice and snow with a one foot wingspan. They can sculpt ice like it was wet clay. Winter-spirits migrate south during winter, where they study flora, fauna and landscape. They are only present in places with ice and snow. They return to the north pole over summer, where they use this inspiration to create sculptures. They breed here, with the quality of the sculptures being the metric for sexual selection. Ashalla made them primarily to maintain the ice sculptures on the north pole's ice sheet. Spent: 4 FP on an ecosystem (enhanced by Oceans to encompass the whole ocean) involving cetaceans and oceanic fish, inhabiting all of Galbar's oceans. 1 FP on the winter-spirits, an extraordinary species. @Scarescrow No worries, Scarescrow. It takes some maturity to identify your capabilities. I hope you find an RP you'll enjoy. The wet soil of Atokhekwoi served as a blotched and dark sky as K’nell walked upside down, his boots stepping on the invisible veil of the sky as if he were walking upright. Any blue that the sky held was long gone, now cloaked in dark clouds that threatened rain. K’nell didn’t seem to mind; he sucked in a few deep breaths, and exhaled the electric soil tinged air, leaving a metallic taste to cover his tongue. Truth be told there was too much on his mind to really take in the wonders of life, his hand firmly grasping the dream orb. The task of walking upside down did not in fact ease his thinking, he sighed, and suddenly fell to the ground. With a gentle shmuk he hit the wet soil, his boots standing firm yet somehow avoided collecting the mud. He pressed onward, a soft hum coming to his lips. As he hummed in thought, his eyes returned to the image of a bird, one that had been following him for quite some time. He had seen it when it broke the horizon hours ago, but only now was it in danger of landing on his own shoulder. “Ah,” The magpie mimicked, soliciting a bigger smile from K’nell. “It’s ah!” The bird echoed. K’nell held out his arm, and the bird landed, it’s tiny feet somehow not even bringing one wrinkle to his jacket. K’nell hummed gently and the bird copied. The two stood like that for hours, until hundreds and hundreds of Magpies flocked the skies. The humming stop and K’nell cleared his throat. K’nell continued to speak, his words exiting his mouth as wisps of glowing white. The wisps held the story of Li’Kalla’s cry for help and the sudden appearance of Vakk’s deadly tentacles, ending it on the story of the subsequent coming of the beast and the splitting soul, and how through these acts Li’Kalla had been broken, only to eventually be saved. The wispy words flew snugly into the bird’s ears, and before long the flock erupted in a cacophony, their bird tongues twisting as they all retold the story over and over, the moral of the story clear yet unsaid; the God of Speech is not to be trusted. He lifted his arm, sending the magpie off into a flurry. Without much more, K’nell shoved his hands into his pocket and continued on his way. The roaring flock broke into all directions above him, their voices thunder as they retold the tale of Vakk and Li’Kalla. The walk was uneventful; the stormy clouds remained, as did K’nell’s many thoughts. His eyes fixed downward, and only after a few taps of his chin did he finally look upwards from the muddy plains. His eyes shot upward at the storm, it’s dark haze hiding the sky. K’nell squinted, noticing a large and familiar soul floating along with the clouds -- no -- was the clouds. An orb of lightning lit up the area around K’nell like the sun. The orb was joined by a second orb, then the impression of a face formed with the two orbs in the place of eyes. "K’nell, we meet," Ashalla’s voice boomed like thunder. There was a pause, only the sound of rain, wind and distant thunder between them. Ashalla was the first to speak. "I noticed a flock of black-and-white birds telling a rather peculiar story not long ago. Would you have had anything to do with that?" "No, although the story raises some questions," Ashalla said, "Where did the beast come from, and whose is it?" Ashalla rumbled thoughtfully. "Of the battle between Li’Kalla and Vakk, I assume there was a physical counterpart. What was the outcome?" K'nell had been finger deep in a small silver tin he had produced from his jacket as the question was poised. Quickly snagging a small finger long cigarillo he snapped the tin shut and slid it into his pocket. The great orbs of lightning which were Ashalla’s eyes flickered imperceptibly as they looked at the miniscule tin and cigarillo. "No," Ashalla said. She then continued with her questioning. "If you only witnessed the aftermath of the battle, how do you know these things?" The end of the cigarillo glew as K'nell took a long vanilla scented pull, he seemed to ponder the question for a moment. Finally he slid the cigar from his mouth and slowly blew a thick stream of smoke. The smoke turned and floated upwards. As it did, the wisps of grey took on new shapes and eventually colors, until Ashalla was seeing --and somehow hearing-- K’nell’s own memories from the moment he had found the puddles, to the conclusion of his time within the dreams of Li’Kalla. The images were in such dimension as to match the many visions of a God, so much so that it is likely any mortal would have been driven mad attempting to see the story in the smoke. K’nell puffed out a ring of smoke, the new miasma ending the story with the image of the bright blue rose he had placed upon the sleeping beast’s snout. Another thoughtful rumble echoed through Ashalla, this rumble bouncing off the landscape and lasting for some time. "You now seek to restore the lost parts of Li’Kalla," she eventually said. "I shall inform you if I happen to locate one of these parts," Ashalla said. There was a lull in the conversation between the two. Ashalla broke the silence. "I met your creation Hermes not long ago." “And how did you take to her?” K’nell seemed to crane is neck upwards in interest. "She is a wonderful dancer and appreciates beauty, although her hubris is perhaps slightly greater than what is appropriate for a mortal and your design for her was lacking in a couple key details," Ashalla said. "If I am creating a fleshy creature, I bring together biomatter and transmute it to form a living creature," Ashalla said, "If you refer to design, the key differences is that I would include a means for the mortal to reproduce and I would include colour." "You are implying an intelligent mortal being similar to Hermes?" Ashalla said. There was a pause. "I do not know. I was speaking of living things in general." "I created a large bird very recently, near the north-eastern tip of this continent. I gave the bird wind in her voice, lightning in her plumage, thunder in her wings, and midnight blue feathers with a dash of azure. I made it to stand above the large beasts Kirron had made in that region." Ashalla seemed to be taken aback by the question. "To show my strength through my creations, of course." Ashalla rumbled for a moment, then answered, "Everyone." Ashalla’s cloudy face gave a nod. "Have you seen Hermes recently?" “I have,” K’nell’s voice hung between them. "Did you like my addition to her?" Ashalla asked expectantly. “I did,” The God of Sleep’s smile flashed again, his voice returning to his mouth. The clouds above K’nell burbled happily. "So, why did you create Hermes?" "Until next time, K’nell," Ashalla replied. The face in the storm disappeared, and the clouds blew away. Taking a stroll on the Krablunds, K’nell is met by an army of magpies. With much on his mind, he decides to bless their mimicking voice and song, so that they retell the tale of Vakk’s assault on Li’Kalla and subsequent soul breaking things. He then sends them on their way. He soon bumps (not literally) into Ashalla and the two talk about Vakk and Li’Kalla. Ashalla does not respond strongly to the story, but promises to let K’nell know if she finds any fragments of Li’Kalla. The conversation quickly dies but then is revamped with talks about Hermes and then some deeper questions on what Ashalla would create, has created, why and for who. The talk ends on her fishing for a well deserved compliment, which she receives, causing her to burble. She then asks K’nell why he created Hermes, his cryptic and somewhat demeaning (to Gods) answer causing her to huff. K’nell finds it amusing and bids her farewell. Ashalla was drifting in the ocean currents once more, idly listening to the music box's tune. In truth, the music was starting to get dull, for the box seemed to have no creativity of its own. The music was all of the same style and sounds, and even some of the melodies were starting to get repeated. She would need to find another source of music at some point, for as Xiaoli had demonstrated with her flute there were many ways to produce beauty from sound. Ashalla also took this time to reflect upon her meeting with Hermes and Xiaoli. She had liked Xiaoli. Xiaoli recognised and affirmed Ashalla's superiority. Although Ashalla lacked the physiology to properly appreciate the tea, her music had been beautiful and even her form demonstrated artistry using nothing but water and river matter. It was odd that Xiaoli, a divine being of water, appeared to have more in common with fleshy beings than herself, but perhaps that was due to her role as Shengshi's advisor. She would have to visit Shengshi some time to discuss Xiaoli, this 'etiquette' and 'manners', and other matters befitting two water gods. As for Hermes, Ashalla had some mixed feelings. Hermes was a beautiful dancer and affirmed Ashalla's artistry, but unlike Xiaoli she was not submissive. In her hubris she had even attempted to form a pact of friendship with a god! Such a naive attitude was understandable from a simple being like Poppler, but Hermes was surely intelligent enough to know better. Yet she said she had successfully made friends with other gods, so this indicated as much about the other gods' characters as it did Hermes'. It was likely a minor misunderstanding, rather than a claim to godhood. Regardless, Hermes had appreciated her gift, and would surely remember her divine power and show it to all Hermes met. As Ashalla drifted and mused, land came into sight. Ashalla did not remember there being land here, although she did remember a while back when she felt a vast amount of ocean being displaced and she mentally correlated the two events. A new continent, another feature in her ocean, had been formed. Ashalla quickened her pace towards the new continent. There were lots of trees, except these trees were different to those which she had seen in the Eye of Desolation or on Kalgrun. She pushed part of her form inland, flooding an area and feeling all the wildlife, identifying some of the plants and animals native to this area. Large, furry, omnivorous quadrupeds stood out as significant, but there were many other species too. She even saw a few Gemstone Gardeners. She navigated south down the coast, and for a time things appeared much the same. Further along, however, shades of red were added to the pallet of green and brown which characterised the flora and fauna. Ashalla tasted this new land, and could clearly identify Kirron's ichor. So Kirron painted this part of the land. Pretty. As Ashalla looked further, she realised that Kirron had done much more than simply apply colour. She saw towering beasts of great strength and was inspired by them. Kirron had filled this part of the continent with powerful beasts. What better display of power and creativity than creating something powerful? And what better way to assert her own might than by creating something more powerful than what she saw before her? The ocean began to churn and swirl as biomatter was drawn in from around Ashalla. The mass condensed in the centre of the maelstrom and began to take shape. Four limbs, a body which extended beyond the lower two limbs and a head which ended in a point took shape. As the flesh was sculpted further, it became apparent that this was the embryonic form of a very large bird, curled up without an egg. As Ashalla continued to shape the creature, it grew, and feathers began to sprout from its skin. These feathers were coloured midnight blue, and crackled with static electricity. It kept growing, its coat of dark feathers becoming complete, its wings and tail gaining a fuller form. From its feet sprung sharp talons and its beak hardened to be sharper than iron. As the great bird grew larger, the electricity in its feathers started to spark and crackle. It only stopped growing once it rivalled the size of Kirron's largest megafauna. As a final flourish, Ashalla added a long azure feather beside each eye, trailing backwards. The creature complete, Ashalla withdrew from the vast bird, freeing it from its watery womb. Its eyelids snapped open, revealing a brilliant blue-white glow. It inhaled deeply, its voluminous lungs filling with air, its chest expanding and wings stretching out. It then exhaled, a great gale blowing across the ocean and pushing waves onto the beach. It flapped its wings to shake the seawater out of its feathers, producing a peal of thunder as it moved. Arcs of electricity continued to dance across its feathers and the water around it. Ashalla watched the creature from all angles and admired her handiwork. This mighty beast would surely be a fitting display of her power in this land of great beasts. Ashalla remembered another thing - she still needed to find a home for the music box. Ashalla fashioned a simple harness and net from seaweed, put the music box in it and wrapped it around the great bird so that the box was held beneath its chest. The bird shifted awkwardly as the sling was tied around it, but otherwise did not complain. With the music box secured, Ashalla withdrew from the bird once more and commanded, "Thunderbird, fly!" The Thunderbird cried an ear-splitting "CAAAAWWW!" then took to the air in a single mighty wing-beat, producing a mighty pulse of thunder which caused the surface of the ocean to ripple. Ashalla watched proudly as it flew inland, sparkling with lightning and roaring with thunder. Yet, as Ashalla watched, a sour feeling of jealousy grew within her. While she was all-mighty in the oceans, on land she was weak. Her journey across the Isle of Twilight had shown her this. Yet countless species and beings on Galbar could travel over land with ease. It was not right for this bird which she had created to be a more able traveller than herself. But the feeling did not stay for long, because she had devised a solution. She had seen enough of the world to be sure that this solution would be effective, both for overland travel and for portraying her strength. As the Thunderbird flew, the ocean steamed. A herd of large creatures grazed on shrubs and grasses in the Great Hooflands. Their hefty tails lazily swung side to side as the afternoon sun shone on their tough, thick skin. As they grazed, a dark shape appeared in the sky, coming from the east and announced by distant thunder. The grazers glanced towards it, but did not give it any thought until the dark shape came much closer. The grazers looked up again to see a midnight blue bird larger than they were diving towards them. They turned their rears towards the bird and lifted their weighted tails menacingly. The bird did not attempt to strike, but instead pulled up before the beasts with a single thunderous wing-beat. The clap of thunder pulsed through the beast before the bird, stunning it, and the terrific noise startled the other beasts who turned to flee. The Thunderbird then dropped on top of the stunned beast, its talons gripping the beast's back and lightning crackling down the Thunderbird's legs. The beast spasmed and writhed as electricity coursed through its body until it dropped dead. As the beast collapsed, the Thunderbird stooped down its head and began to devour the beast with its powerful beak. As the Thunderbird gorged itself on its first meal, the eastern horizon darkened. The bird's nostrils flared and it looked up from its meal towards the horizon. It knew that a storm was brewing. A vast storm cloud blew in from across the horizon, carried by hurricane-force winds. The storm cast a deep shadow upon the ground beneath it, casting a darkness blacker than night illuminated by frequent flashes of lightning. Rain pelted the ground below, flooding the savannahs of the Hooflands. The Thunderbird cawed as the storm drew near. It stretched out its wings and was swept up by the storm's mighty winds. The Thunderbird banked around and flew into the dark cloud, unafraid of the turbulence and heavy rain. Lightning struck the bird, but rather than harming the bird its feathers crackled more strongly until it discharged into the clouds. The Thunderbird easily found an updraft in the storm and rode it until the bird was above the storm. From this great altitude the Thunderbird saw the expansive Great Hooflands stretch out beneath it. A voice like a buffeting gale spoke from the storm to the Thunderbird. "You have eaten. Good. Let us find a worthy roost." "CAW!" The bird scanned the horizon. The western horizon was rugged from a distant, vast mountain range which tapered away towards the northern end. Yet just beyond the end of the mountain range proper was a lone mountain. "CAW!" 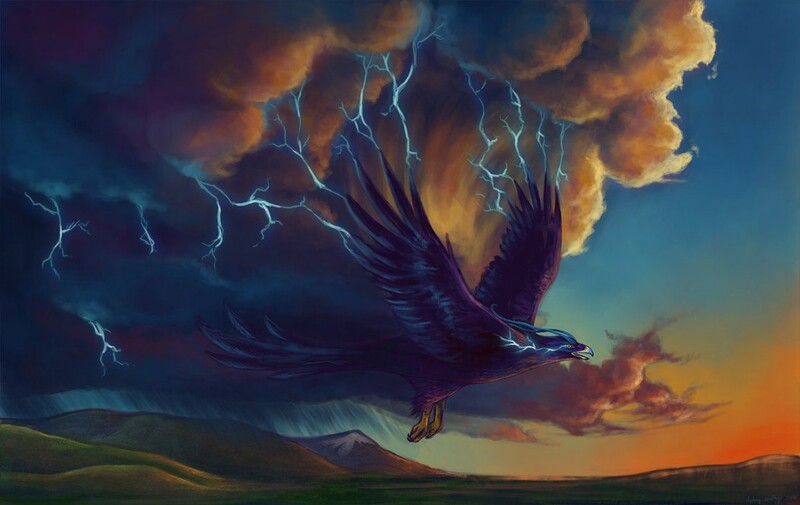 "Very well," said the storm who was Ashalla as the Thunderbird glided towards the lone mountain, riding her winds. Raucous thunder rolled over Mount Chop as the Thunderbird landed on its plateau. Ashalla's howling winds soon followed, her form towering as a colossal cumulonimbus. Two orbs of lightning crackled into being near the exterior of the cloud facing the bird and Mount Chop. "Yes, this is a fitting roost. It has a commanding view of the surrounding countryside, ample flat space to make a nest, and you claim ownership over a landmark sculpted by divine hands. It would be hard to claim a better location," Ashalla said with a voice like pouring rain. "Coo," the Thunderbird cooed, it's voice still carrying incredible force and volume despite vocalising calmly. "Now, remove the netting," Ashalla commanded. The Thunderbird hopped onto one foot, reached up with a talon and tore apart the seaweed ropes around its chest. The Box of Orchestration clattered to the ground. A forceful wind picked up the box and set it down the right way up. "Keep that box safe," Ashalla commanded. Satisfied, Ashalla withdrew and blew away, deeper into Atokhekwoi. The Thunderbird watched the storm recede over the horizon. Then it circled around the plateau it had claimed as its home. A flap of its wings stunned a warren of small furry creatures, which the Thunderbird promptly devoured as a quick snack. It uprooted the trees which had attempted to grow on the rocky plateau and laid them out in a protective circle around the music box. It strutted some more until it noticed movement in the distant plains below. A herd of creatures. Dinner. "CAAAAWW!" the Thunderbird cried as it took to the skies once more, thunder heralding its flight. Ashalla recovers her music box. She's starting to grow tired of it. Ashalla reflects on her meeting with Xiaoli and Hermes. Ashalla discovers Atokhekwoi and the Great Hooflands. We see the Thunderbird in action hunting its first meal, a dinosaur, using thunder to stun and lightning to kill. Ashalla arrives as a storm. The Thunderbird has an unusual affinity for storms. They fly to Mount Chop and the Thunderbird makes its roost there. The Box of Orchestration is left here for safekeeping. The Thunderbird is now the alpha predator in the Great Hooflands. @Scarescrow If the aura is extremely bright, like sunlight, that is not something you could get for free. If it is just some gentle illumination or a soft glow, that should be acceptable. @Scarescrow To be clear, Anzillu can still be your parent if @LokiLeo789 wants. You just have to figure out a different way for him to be his parent. For the abilities, the light part of Praise Be The Light might be stretching things depending how bright it is, although making others more likely to like you is appropriate. Sacred Bonds does not appear to fit under the Love Portfolio, and even if you could wrangle it in it sounds like a Blessing rather than an Ability. Give us your revised CS when ready.